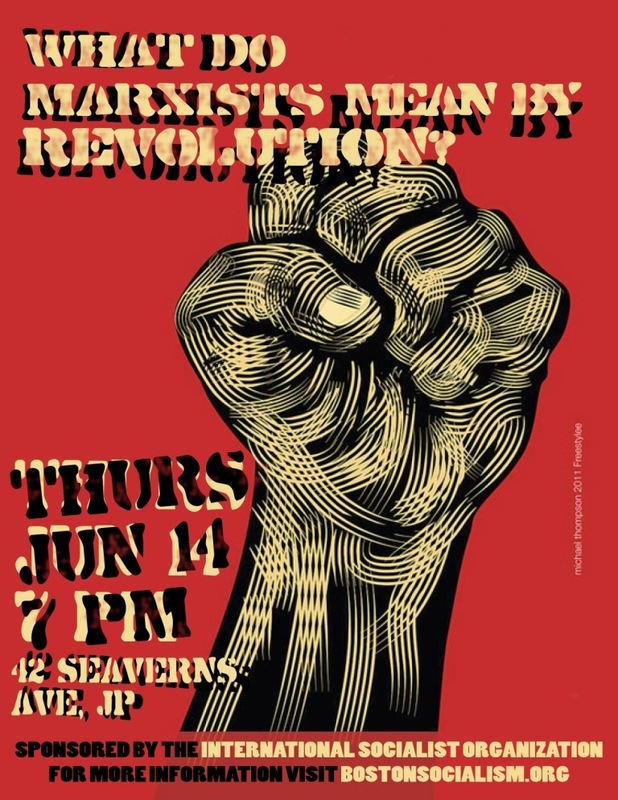 BOSTON SOCIALISM: Thurs, 6/14, Jamaica Plain, "What Do We Mean By Revolution?" Thurs, 6/14, Jamaica Plain, "What Do We Mean By Revolution?" From Occupy to Trayvon Martin to Greece and Egypt, millions across the world are standing up and fighting back against racism, injustice, war and inequality. These fight backs are necessary and show that the voice of the people matter. Many people have come to the understanding that we need a new system. But are we in a revolutionary moment today? Are protests revolutions? What kind of revolution do we need? What would a successful revolution look like? Please join us for a public forum to discuss what Marxists mean by revolution and how such a conception differs from other views on revolution that exist today.